Google has confirmed it will sponsor the Google Summer of Code 2007, and Joomla! will again be participating in this great event. Last year we had six sponsored projects, guided by twelve mentors and six students working on research for the future Joomla! 2.0. 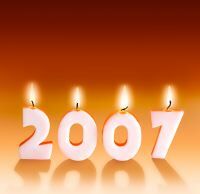 This year we will try to be even more productive and more successful than we were in 2006. For Joomla!, the Summer of Code brings several benefits. It helps bring fresh ideas and talents together in a co-ordinated way and has provided the project with four new development workgroup members who are now active in creating Joomla! 1.5. We expect one of these students to be a mentor within the 2007 Summer of Code Campaign. Today Drupal announced the release of the long awaited Drupal 5.0, appropriately and symbolically released on Drupal's sixth birthday. We would like to offer our congratulations to the guys and gals making Drupal what it is and to let them know that we are enjoying the celebration as well. We have met many of the Drupal contributors at various events and consider them friends with common goals. Our two projects are often compared, and there is nothing wrong with comparison... but make no mistake of it, we are all on the same side working to enable people... because we both believe that open source matters. So from one open source project to another: Congratulations!! On the eve of New Year, imagine that Joomla! was a person. If Joomla! was a person, its oxygen would be the myriad of active fingers on keyboards logging into the Joomla! website, the forums, extensions and developer zone, attending Joomla! Days and checking out hosts of community and fan sites. Yes, yes, Joomla! has won awards. Many. But the accolades are not oxygen. Joomla! feels great joy because the past 12 months has seen a mature ecosystem evolve; where people from all walks of life, all races and religions are equal. Equal to share, equal to learn, and equal to participate in an online community. And with those skills, everybody is able to craft a website, start a business, perhaps even ensure financial freedom for their family! Joomla! 1.0.12 [ Sunfire ] is available as of Monday the 25th of December 2006 1:00 UTC for download here. We are also pleased to announce the creation of a new Security Announcements Forum. As the name suggests, this forum will be used for security announcements for the Joomla! core and third party extensions. We strongly encourage that all Joomla! users register on forum.joomla.org and subscribe to this forum to ensure that they receive notification of important security issues as soon as possible. We also encourage you to do same for all third-party extensions you use, where available. Johan, Chris and Louis celebrating! Joomla! 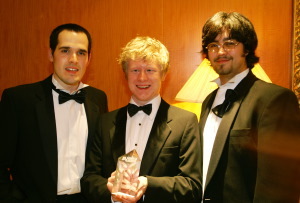 won Best Linux / Open Source Project at UK Linux and Open Source Awards 2006, in London tonight. This is the second year running, the Joomla! team has won the prestigious award. Louis Landry, Johan Janssens and Peter Russell accepted the award from LinuxUser and Developer magazine publisher Maggie Meer. Johan described the win for Joomla! as "one for the community". "The buzz around the Joomla! project is driven by our huge user base and this translates into what is fast becoming the most popular open source framework going," Johan said. Chris Adams, of Rochen, who is a major sponsor of the Joomla! project was nominated as Best Linux Open Source ISP / Internet Host. Unfortunately, Rochen missed out this year but it was great to have Rochen with us to celebrate. "Chris and the Rochen guys are part of the Joomla! family ... this is as much Rochen's award as it is the developers and the communities." It's Voting Time - Show Your Support for Joomla!